Fire plays an important role in various aspects of the Hindu Tradition. It is both the creator and destroyed of life, and those that follow the Hindu tradition recognize this fact through several of their rituals and practices. Fire plays a role in cremations, the worship of important deities through sacrifices and offerings and in daily Hindu routines. It is apparent that in the Rg Veda and in later Vedic writings that interest moved more towards the fire sacrifice and Agni, and away from the other gods. Worship of these other gods was mostly through fire rituals. Any offerings that were to be given to the gods were placed in the fire and Agni would transport them to the other gods (Hopkins 14). These rituals were possible for Hindu’s of any social standing due to their ability to create fire (Hopkins 13). The importance of fire is evident in how offerings were actually conveyed to the gods, for without fire, it would be nearly impossible. Agni is mentioned more times in the Vedic hymns that any other deity. Although Agni is not the creator god of the culture, he is still hugely popular and significant to Hindu’s. His importance lies in that he represents fire, something of great human value (Bowes 109). The importance of Agni comes through his association with fire, assisting in how vital his role is for worship. Agni plays a vital role in connecting Hindu’s to their deities by conveying offerings. He also assists in helping Hindu’s that had passed away into the afterlife. Because of this, Agni could be seen as assisting Hindu’s in physical matters by providing head and light, but also by supplying them with emotional and spiritual connections. Because he is considered the god of fire, it could also be assumed that he has control over Hindu’s life cycles. Fire supplies life, cooking food, supplying heat and giving off life. Fire is also seen as the end of a Hindu’s life as they are consumed by flames in a funeral pyre, sending them on to the afterlife. Because Agni supplies the fire in both cases, the life cycle of Hindu’s could be controlled by him. Fire can be both the sign of life or death. Fire can be associated with the creation of the Cosmic Order, or Rta, and of Truth (Sitya). According to the Rg Vedic hymns, this creation was brought around by heat, or from tapas. The ripening or cooking of food could be seen as providing life to Hindu’s (Hopkins 26). Fire is one of the most traditional forms of gaining heat which is one of the reasons that Hindu’s started to worship it and respect the powers it grants. Through fire, life can be sustained as it helps cook food, provide light and offer protection. It provides Hindus with a defensive tool to scare off predators. It could supply light and heat to help Hindus survive. Fire can also help feed the people by providing heat to cook food and provide suitable drinking water. All of these reasons are vital to sustaining life, and the Hindu tradition recognizes that fire gives them advantage, so they worship fire accordingly. It is Agni the Fire god that presides over the great events that happen in an individual’s life, and will accept their body when they die through the fire of a funeral pyre (Vir Singh 41). The cycle of death also goes out through the fire as the body is cremated. While the fire consumes the body, Agni takes the body parts and transfers them to a heavenly plane where another body is created (Wilkins 403). The wood faggots that are used on the funeral pyre need to be chosen carefully so they are acceptable to the cremation ceremony. It would be best if the wood was sacred and brought from a priest’s residence. Wood should be avoided if it is brought from another pyre, or wood that had belonged to an outcaste or anyone that was unclean (Wilkins 387). This demonstrates how the rite of cremation and the burning of the body were to be respected and the ceremony was to be respected, but also how the fire that accepted the body was ritually pure. 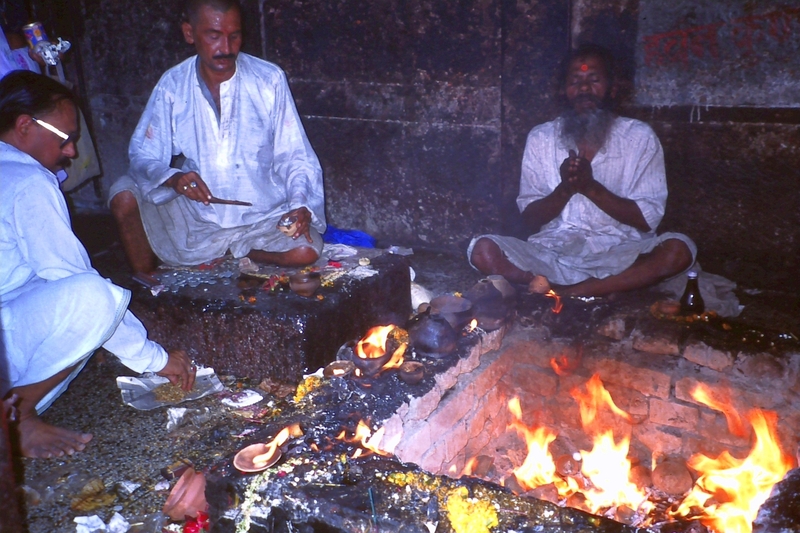 This is evidence that fire plays an important part for the final stage of a Hindus life cycle, and is used as a method to move onto the next stage in the afterlife. The use of fire can also take minor parts in rituals or celebrations, but it is still vastly significant. At the Holi festival, a bonfire is lit towards the end and games are played. This is to symbolize the young Krsna (Monier-Williams 150). This use of fire is a way of connecting to the gods through a festival, and having them observe the proceedings. Some of the rituals that are used with fire are the burning of the camphor, to show that the ego should melt along with the camphor and the soul should become one with the supreme (Vir Singh 13). In Bhakti Yoga, one of the five offerings that can be made to the deities is dipa, or a flame offering. Just the application of fire to bring about a spiritual connection shows how important fire is to the Hindu people. Fire took place in wedding rituals between Hindus as well. They can only be accepted as a true married couple if they complete one of the rituals of saptapadi (seven steps) around a fire (Bharati 185). Perhaps one of the reasons for this action is a connection to the gods, as evidence that they have witnessed the wedding. It is because of rituals like this that we can assume that fire not only plays parts in religious aspects, but also in daily aspects as well. The importance of fire does not need to be the key focus of any of the celebrations, but its inclusion in several ceremonies even in minor roles shows how it is still an important aspect. All of these are examples of how fire plays an important part in Hindu practices. It is a symbol and a connection to the gods. Agni plays a special role in the connection through the fire and many Hindus feel it necessary to worship him more than the others. Fire can play a difference between life and death. It grants life through supporting the people with food and protection. But it can also mean death and destruction. Fire is used in several rituals, and it does not really depend on the rituals importance. Hopkins, Thomas J. (1971) The Hindu Religious Tradition. North Scituate: Duxbury Press. Bowes, Pratima. (1977) The Hindu Religious Tradition: A Philosophical Approach. London: Routledge & Kegan Paul. Vir Singh, Dharam. (2003) Hinduism: An Introduction. New Delhi, Rupa & Co.
Wilkins, W.J. (1900) Modern Hinduism : An Account of the Religion and Life of the Hindu’s in Northern India. Dehli: B.R. Publishing Corporation. Monier-Williams, Monier. ( 2003) Hinduism and its Sources: Vedic Literature – Tradition and Social and Religious Laws. New Dehli: Munshiram Manoharlal Publishers Pvt. Ltd.
Bharati, Dayanand. (2005) Understanding Hinduism. New Delhi: Bharati Dayanand. Written by Jeff Rasmussen (Spring 2008) who is solely responsible for its content.